About 10:30 this morning, we headed into Grand Canyon National Park. There was a quarter to a half-mile line at the entrance booths. 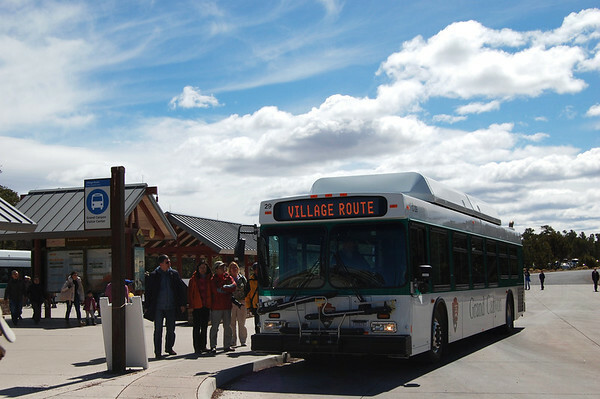 Once in, there was plenty of parking at the visitors center. 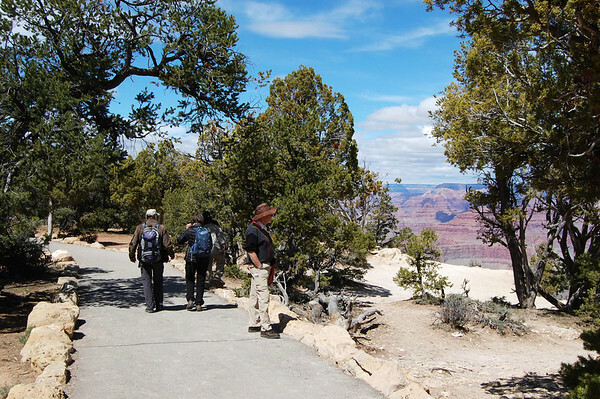 We didn't really have a plan for the day other than our need to "check in" at the Bright Angel Lodge Transportation Desk and once again confirm our reservations and food orders at Phantom Ranch for our hike to the bottom of the canyon tomorrow. So, we improvised. to the lodge and checked in. 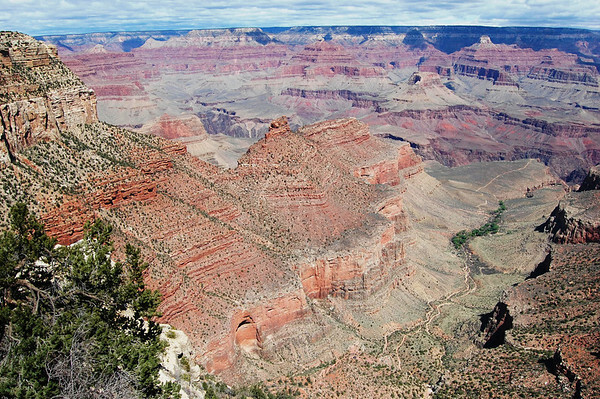 From there, we decided to walk back the three miles or so along the Rim Trail. 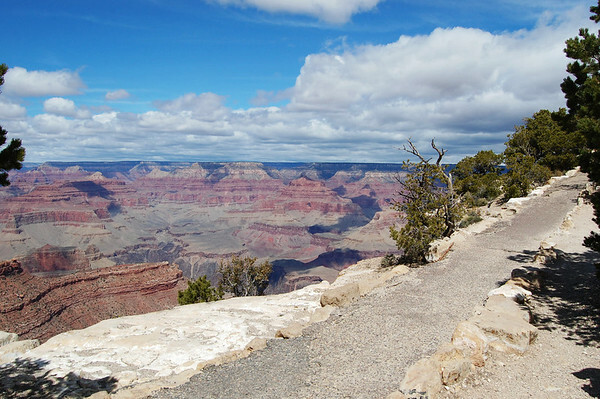 They call this the Rim Trail for good reason. 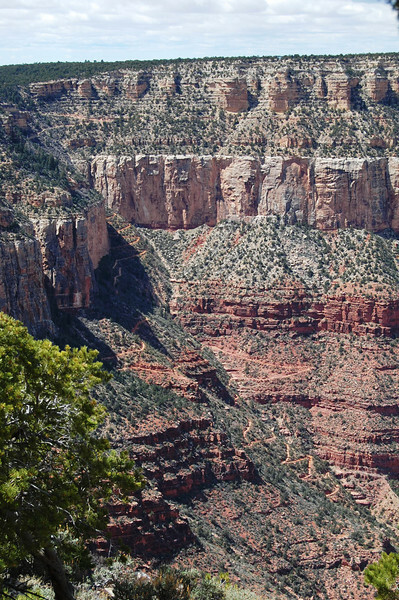 Linda said she was surprised by the trees and vegetation around the canyon as she thought it would be more desert-like. 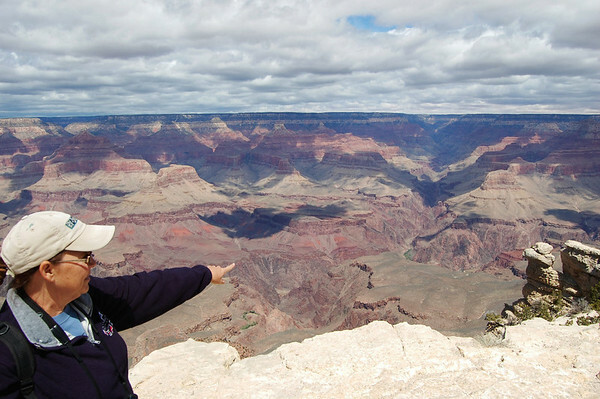 Also, she thought there would be a few viewpoints where we could see the canyon and didn't realize so much of the rim was accessible. 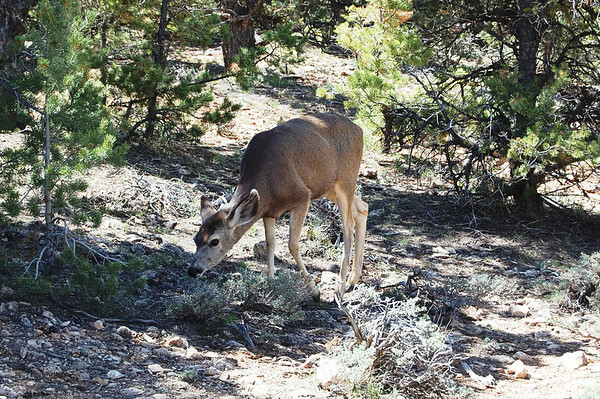 We continued and there was a small herd of Mule Deer next to the trail. As we moved east, we looked back for today's intimidating view of the last couple of miles of switchbacks going up the Bright Angel Trail. 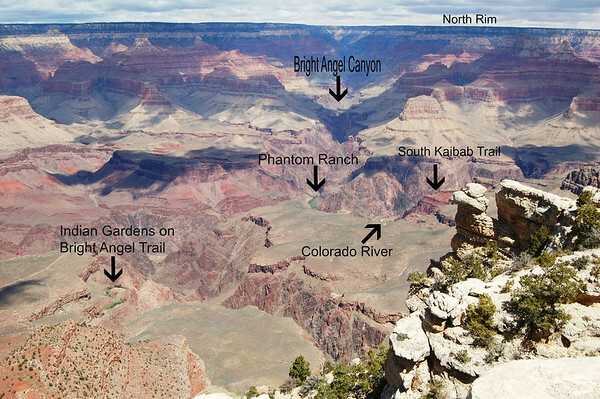 When we got closer to Yavapai Point, Linda pointed out Phantom Ranch, the Colorado River, and a small section of the South Kaibab Trail. I added a few labels for perspective. 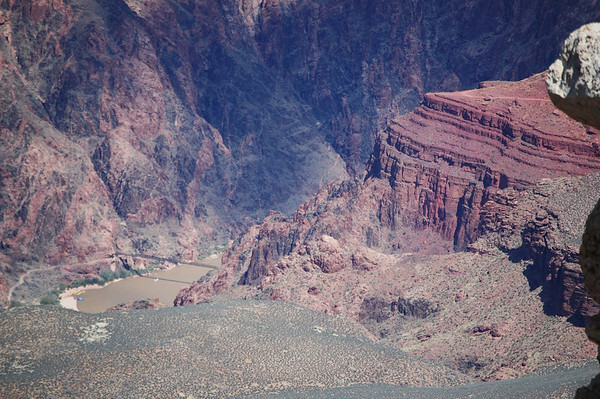 Here's a zoomed in look at the Colorado with a raft under the suspension bridge we'll cross tomorrow. 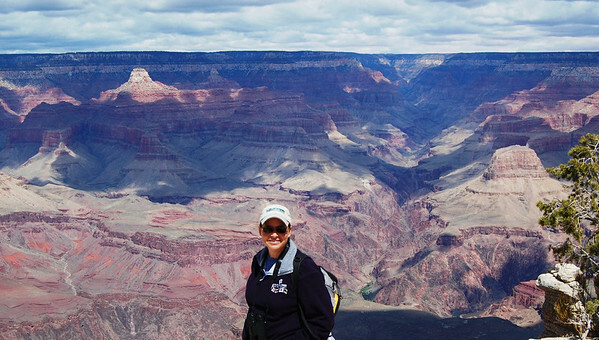 Linda posed with tomorrow's destination, Phantom Ranch - the little green speck right behind her day pack. Moving on, we stepped into the Yavapai Geology Museum. 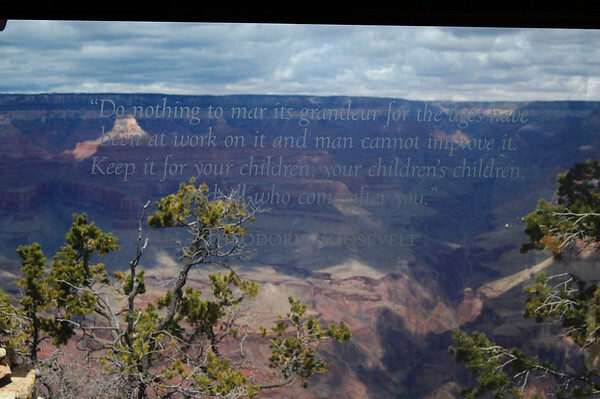 On one of the panoramic view windows was this Theodore Roosevelt quote. By the time we got back to the Jeep, it was quite overcast and the high was only around 50. We decided to call it a day and head back home to finish up our preparations for our two-day hike and get a little rest.